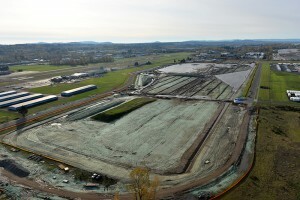 If you have been near the Troutdale Reynolds Industrial Park (TRIP) recently, you may have noticed growing site activity and a larger pond of water. 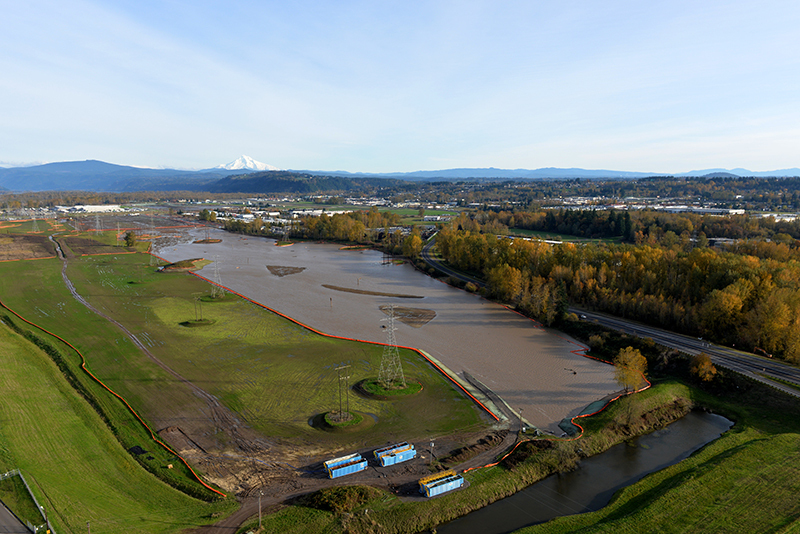 This brownfield site was once considered too contaminated for development but today, Port of Portland staff and contractors are tackling this complex project. Dating back to 2007, this challenging site involves legacy contamination, existing utility infrastructure, flood management, air traffic safety concerns and natural resource protections. The Port’s work is advancing a nationwide model of sustainable industrial development that earned the 2011 Phoenix Award for top brownfield redevelopment project in the U.S. 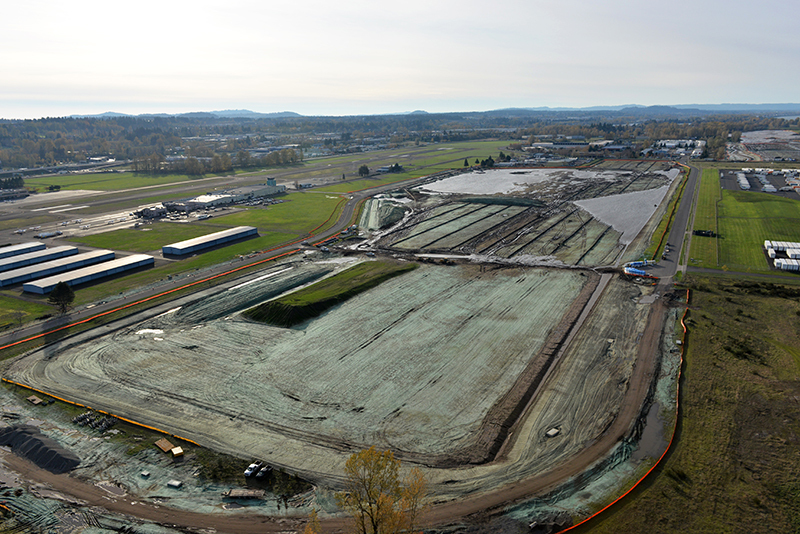 The 700-acre site includes a combination of open space and industrial lots that will be home to future businesses and new wetland habitat as part of a mitigation plan. The plan consolidates small isolated wetlands into a much larger wetland system with greater benefits to wildlife and water quality. 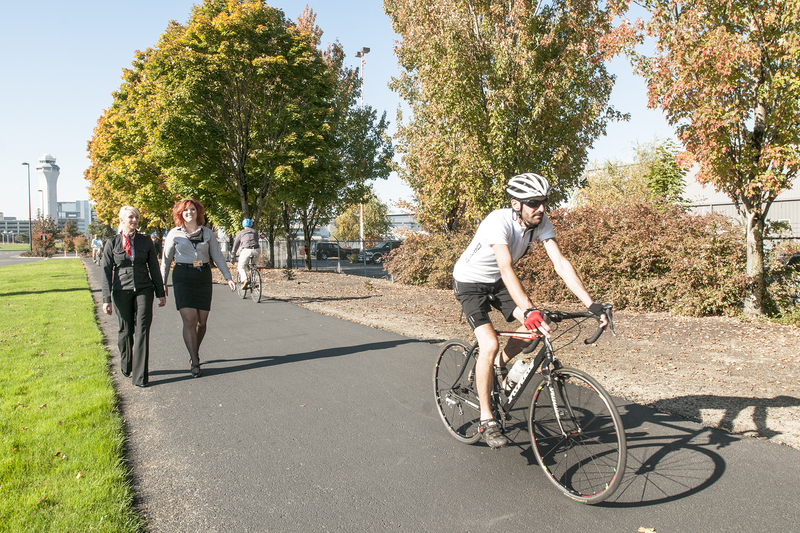 TRIP also offers 1.7 mile section to the 40-Mile Loop Trail, with more additions on the horizon for recreational use. 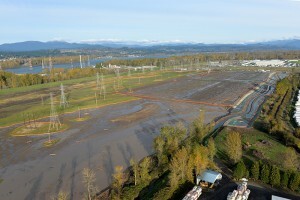 Located at the confluence of the Sandy and Columbia Rivers, the site provides a unique opportunity for wetland creation and enhancement, along with many challenges to restore a wetland in a dynamic, riparian environment. 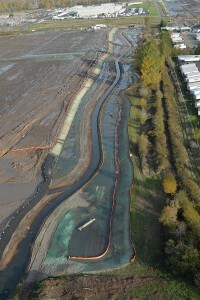 Extensive channel restoration is occurring as the flow of Salmon Creek is directed west of Sundial Road to form the new Sundial Channel – expanding the freshwater habitat and floodplain capacity. As earthwork sculpted the meandering channel and lowlands, recent heavy November rains resulted in high water levels at the site during the construction phase. This heavy rainfall during the construction phase accounts for the muddy water now temporarily ponded on site. The new site is designed to accommodate some ponding seasonally once native plants are established in the wetland. As the site matures, waters clear, and native plants take root, the water levels will recede to a shallow, marshy environment dominated by woody shrubs, limiting the expanse of open water in the basin. 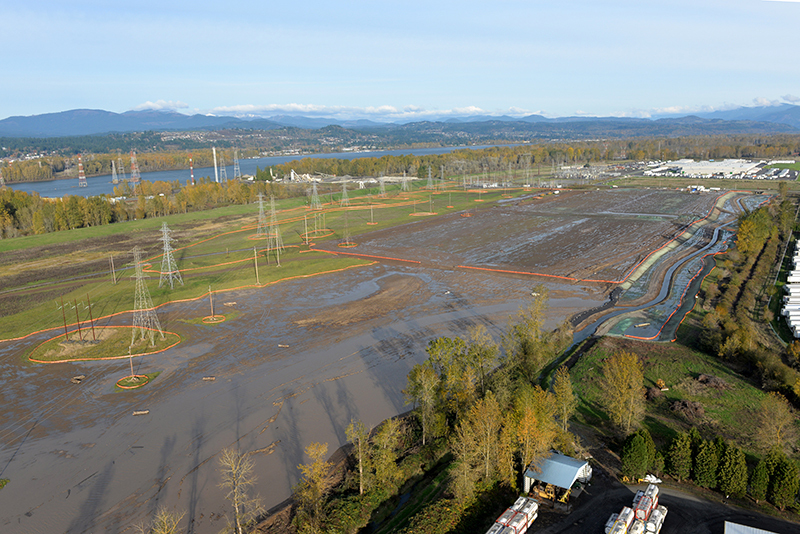 The Port carefully manages water levels to ensure water quality goals are being met while minimizing wildlife attractant issues of concern for the Troutdale Airport. Large numbers of geese are congregating in the temporary expanse of waters resulting from heavy rains. 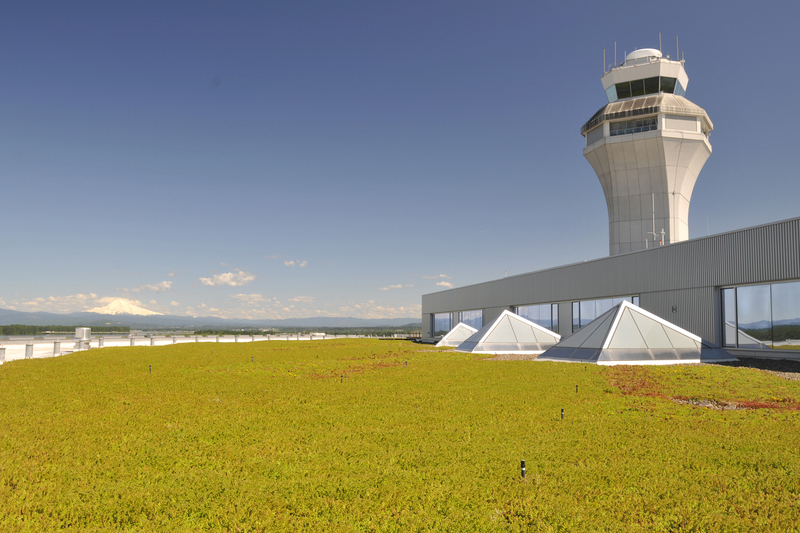 Given the proximity of the project area to Troutdale Airport, and the risk of bird/aircraft collisions, the Port’s award winning PDX wildlife hazard management team is carefully managing these waterfowl to prevent interference with operations at the nearby Troutdale Airport. They will primarily haze birds away from the area by using loud noises, trained dogs and installing silt fencing as a visual deterrent. To ensure that the Port was able to conduct this hazing, the Fairview City Council amended their code to allow for pyrotechnics to scare birds, as well as firearms to dispatch birds in extreme situations. 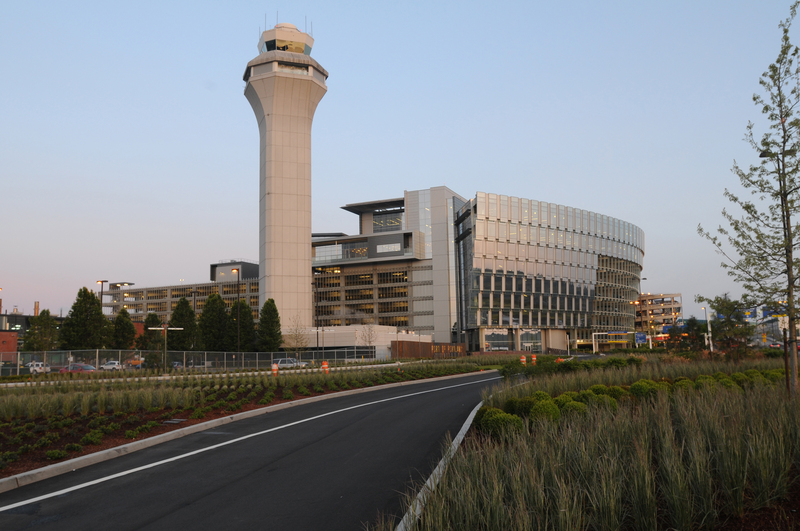 City of Troutdale code was also amended to allow pyrotechnics and firearms to be used for wildlife hazing to reduce the risk to safe aircraft operations.